Hey there. The fans have been clamoring for a Majora's Mask remake and Nintendo is finally making it happen. Even though the game has been announced and confirmed, today we hear that a special Majora's Mask 3DS Bundle will be offered. Just look at it!!! LOOK AT IT!!! It's freakin' beautiful!!! 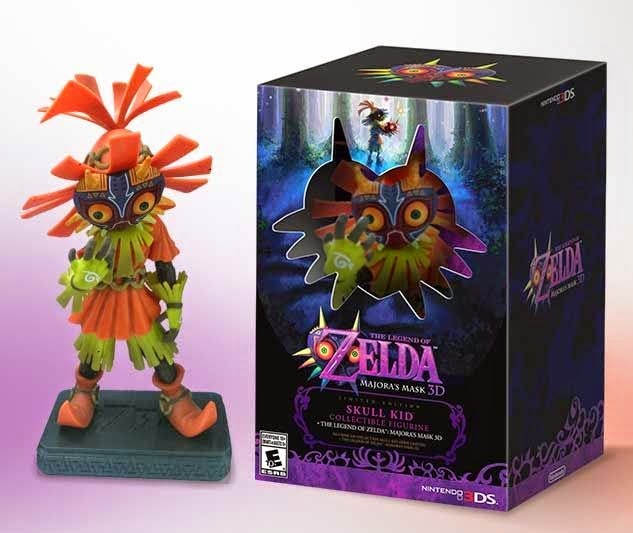 The bundle includes Majora's Mask for the 3DS and a very awesome looking Skull Kid figurine! The bundle is set to sell for $49.99 and there is no word just yet if the Skull Kid figurine will be sold separately. This is a limited edition bundle so I strongly suggest you pre order it now on Amazon before you miss out. Majora's Mask is definitely one of the darkest Legend of Zelda games and it's freakin' fantastic that it will finally be available to the next generation of gamers. Will you be picking up Majora's Mask? If you've played the game, what is your favorite part? Let's hear it in the comments, friends! Later!